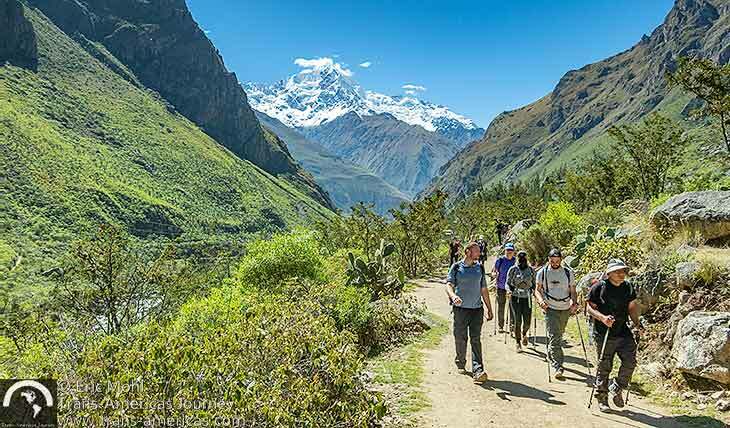 There are dozens of outstanding trekking and hiking options in Peru including routes around Ausangate mountain, through the Lares Valley region, around massive Salkantay mountain, and the Santa Cruz Trek in the Cordillera Blanca. 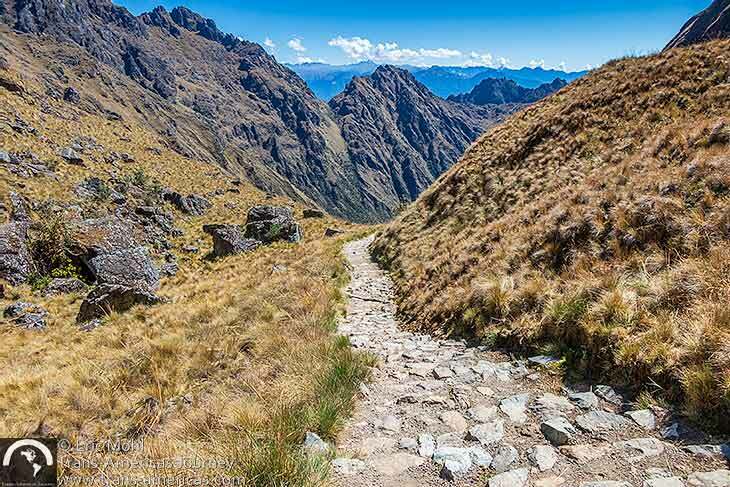 However, the Inca Trail trek to Machu Picchu is by far the most popular hike in Peru. 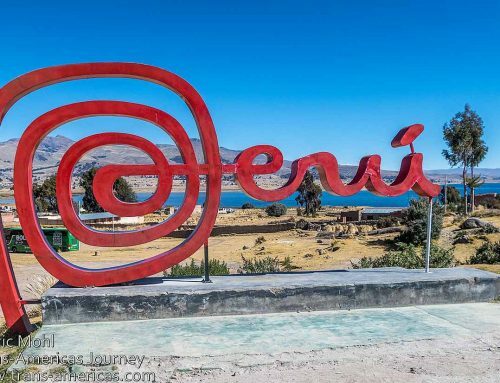 It’s an iconic Peruvian experience and we recently hit the trail to see what it’s all about. And so it begins: crossing the Urubamba River to set boots on the start of the Inca Trail trek to Machu Picchu. 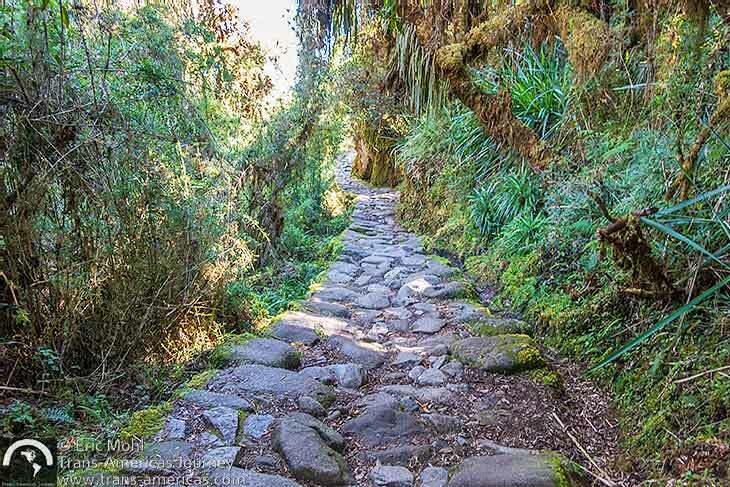 What is the Inca Trail trek to Machu Picchu? 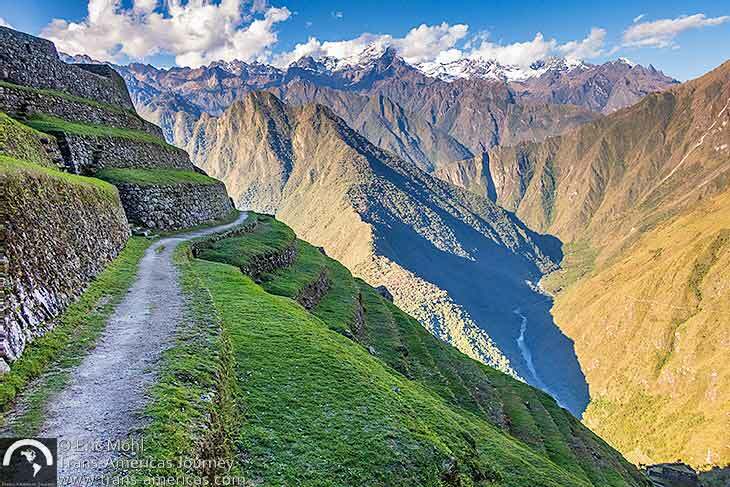 The first thing to realize about the Inca Trail trek to Machu Picchu is this: while you will be hiking on parts of what’s come to be known as the “Inca Trail”, this roughly 27 mile (44 km) route includes just a tiny fraction of the vast network of pathways the Incas created which include 18,600 miles (30,000 km) stretching from Colombia to Argentina. 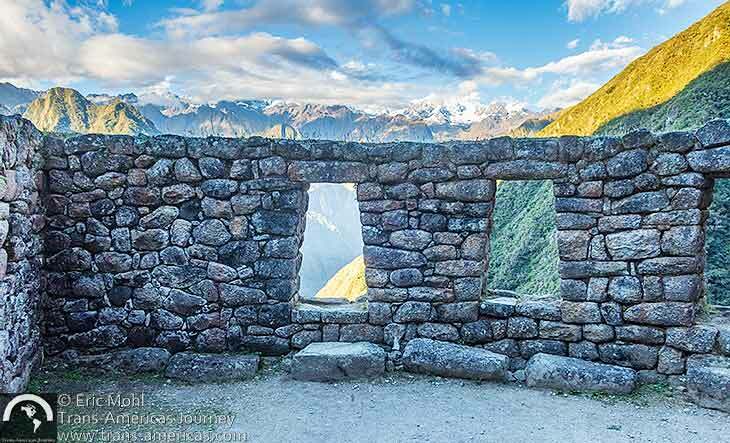 In fact, the Incas created two routes through this region to Machu Picchu. An easier riverside route was reserved for nobles. The route which trekkers take today travels through valleys and over high passes and was used by commoners because it was believed that they (and us) needed to offer their sweat and effort to the mountain gods called Apus. The second thing to realize is that you can cover this roughly 27 mile (44 km) route in three, four, or five-day itineraries. 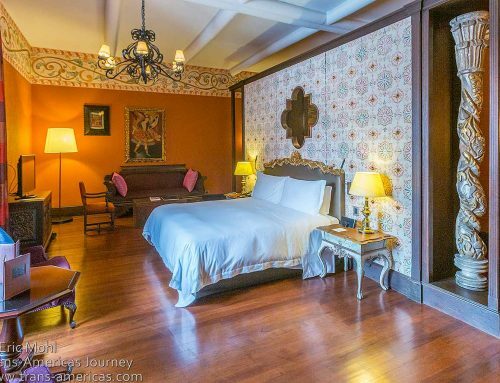 All of them take the same stretch of Inca Trail and all end at Machu Picchu. The main difference between the itineraries is pace (obviously a 3-day itinerary is going to cover more ground each day than a 5-day itinerary). 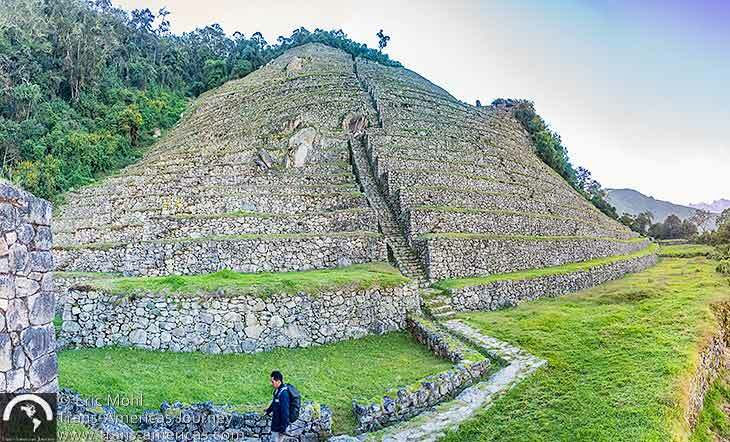 Also, only the classic 4-day itinerary delivers you to the Sun Gate entrance to Machu Picchu near sunrise. That’s the itinerary we chose. Karen on the Inca Trail to Machu Picchu. 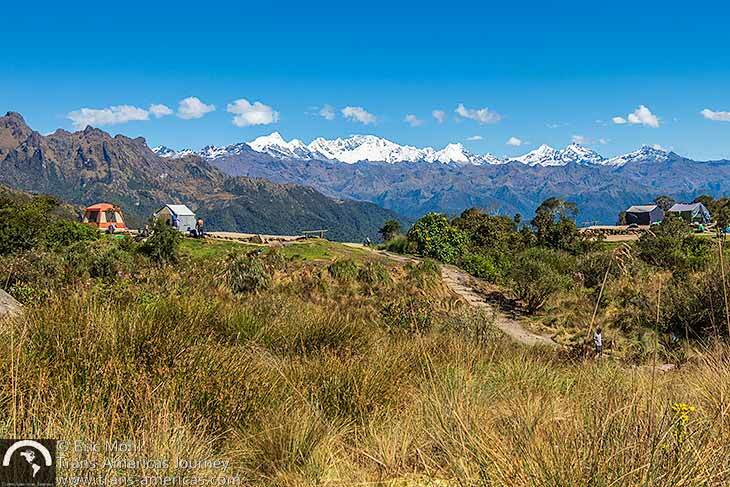 The third thing to realize is that this trek is offered year round (except during the month of February when this stretch of Inca Trail is closed for refurbishment), but there are weather differences to consider. During the summer months (December to April) temperatures are warmer but conditions can be wet and rainy. 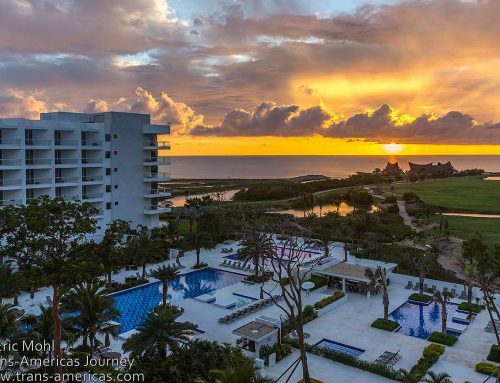 During winter months (May to November) skies are clear and conditions are generally rainless but temperatures can be much colder. The fourth thing to realize is that 500 permits are issued for this trek per day. This includes permits for trekkers and permits for their support staff. For example, we were a group of only two trekkers but we had a support staff of nine, so the two of us took up 11 permits or 4.5 support staff per trekker. Things get a little more efficient with larger groups. A group of eight trekkers, for example, might require a support staff of 16, or 2 support staff per trekker. This breaks down to roughly 150-200 trekkers per day on the trail with the rest of the day’s allotted permits going to their porters, guides, and cooks. Permits for this trek sell out months in advance. 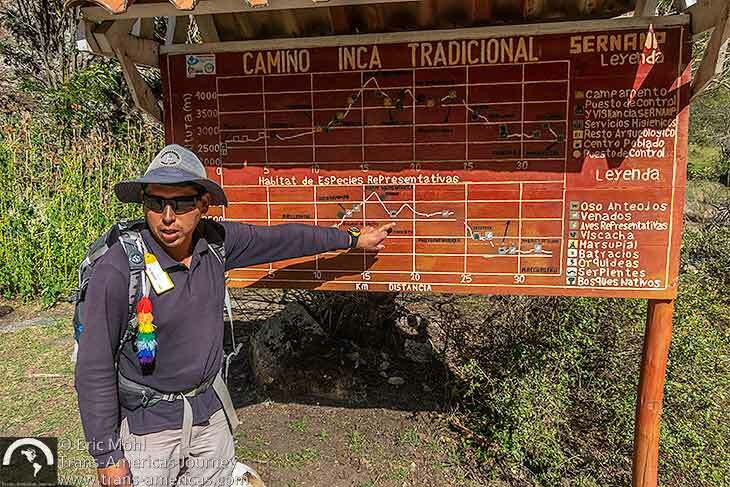 Inca Trail permits for 2018 went on sale in October 2017 and our dates in June 2018 were sold out by the end of November 2017. So, planning ahead is essential, particularly if you want to trek during the prime months of May to September. 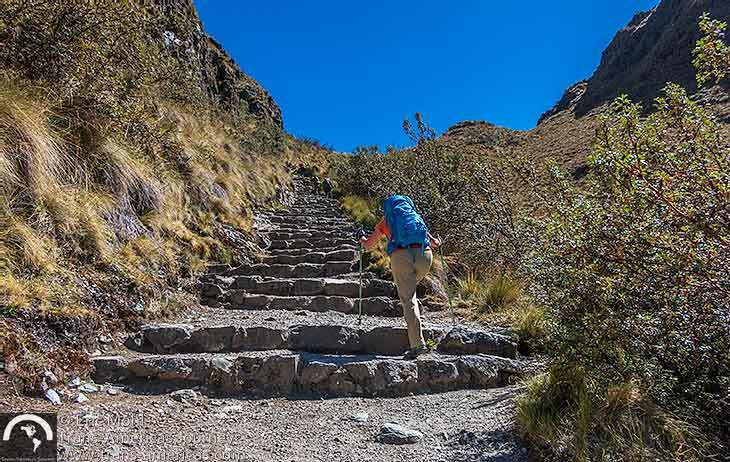 If getting a permit for the full Inca Trail proves tricky, consider the 2-day itinerary known as the “Short Inca Trail” to Machu Picchu. 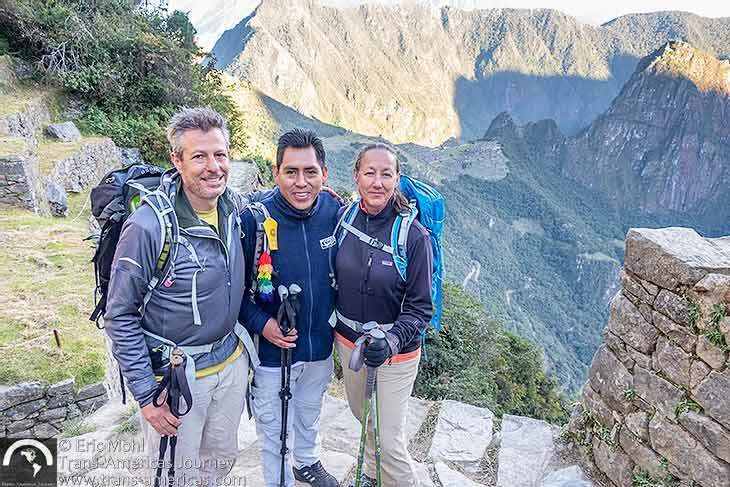 While the 500 permits per day allotted for the longer Inca Trail treks sell out months in advance, you can usually get one of the 250 permits allotted per day for the “Short Inca Trail” route. The final thing to realize is that this is not a trek to scoff at. The route goes over three passes including one that’s 13,829 feet (4,215 meters) high. At those altitudes, acclimatization is a must. And the steep trails demand strong quads and hardy knees. After the first day, there are very few flat areas which means you’re almost always going up or down, often on rocky trail and over stone stairs. 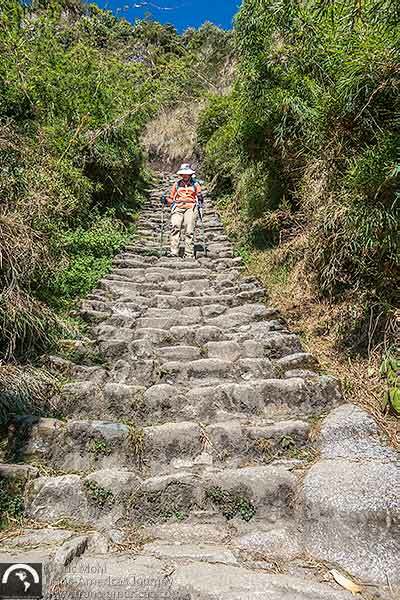 Speaking of stairs, one day includes more than 5,000 of them descending over 5,380 feet (1,640 meters). 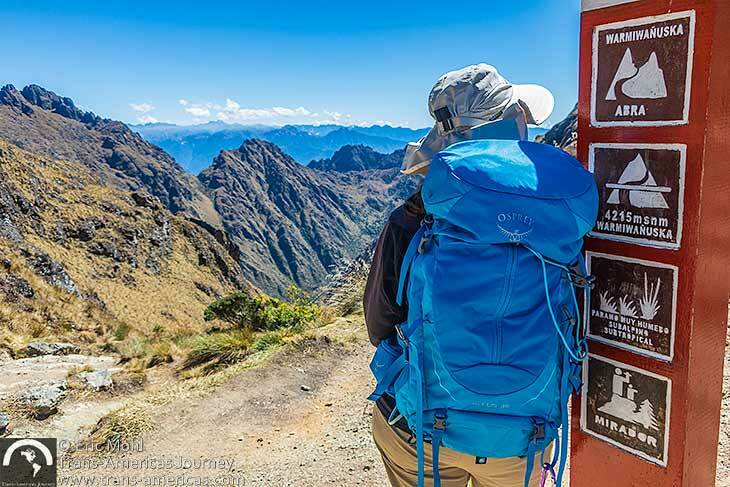 This is not the hardest hike in the world and not even the hardest hike in Peru, but solid fitness and time to acclimatize for at least a few days in Cuzco (spelled Cusco locally) or the Sacred Valley before trekking is a must. 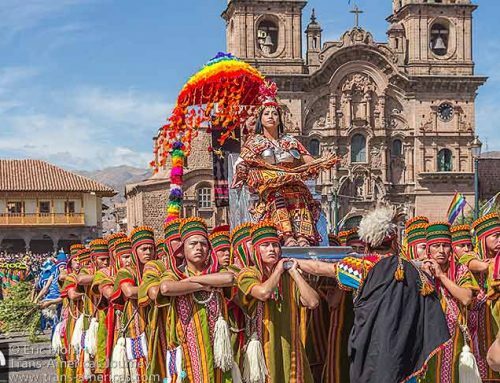 Cuzco is bursting with tour companies offering the Inca Trail to Machu Picchu. Prices, and quality of service, equipment, food, and guides, vary a lot. Beyond cost and quality, it’s worth considering the tour company’s policies about employee working conditions and any policies about responsible and sustainable tourism and philanthropy. When we examined all of these elements we were drawn to a company called Apus Peru Adventure Travel Specialists. 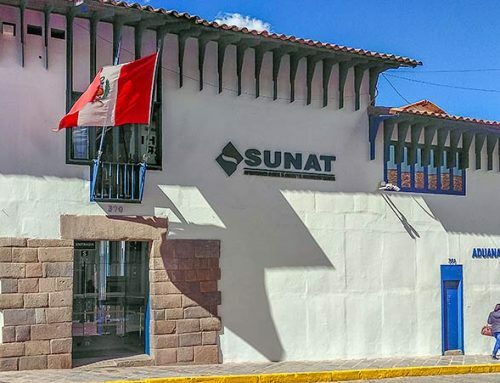 We first got to know this company a couple of years ago during our very first visit to Cuzco when we attended an evening lecture about the company’s philanthropic arm called Threads of Peru which works with weavers in Andean villages to develop a profitable outlet for their work in order to preserve weaving traditions and give gainful employment to rural Peruvians. 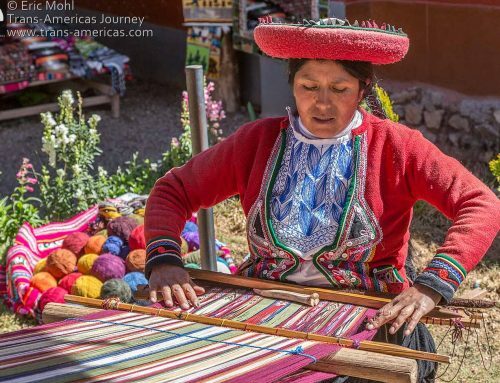 A portion of the cost of all trips booked through Apus Peru goes to support the work of Treads of Peru. We like that. We also like the overall attitude of this company. 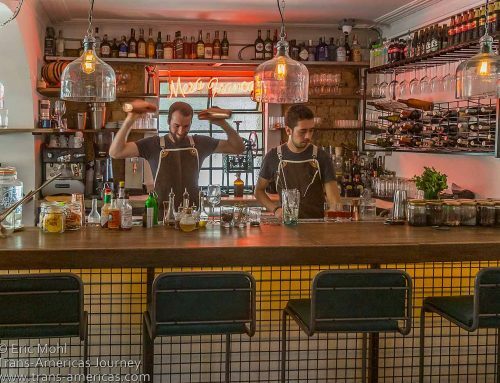 Though it’s owned by an Australian woman, they keep a sharp focus on the working conditions and rights of the Peruvian staff they rely on and have learned to do business in Peru with respect for Peru, not by imposing an Australian notion of how to do business. They also use respectful language, like stating that Machu Picchu was “rediscovered” by Hiram Bingham when most say that the Yale South American history prof “discovered” the place (clearly not true since locals guided him to it). We were confident that respect like that would extend to the trail experience. Our guide Herbert pointing out the highlights. 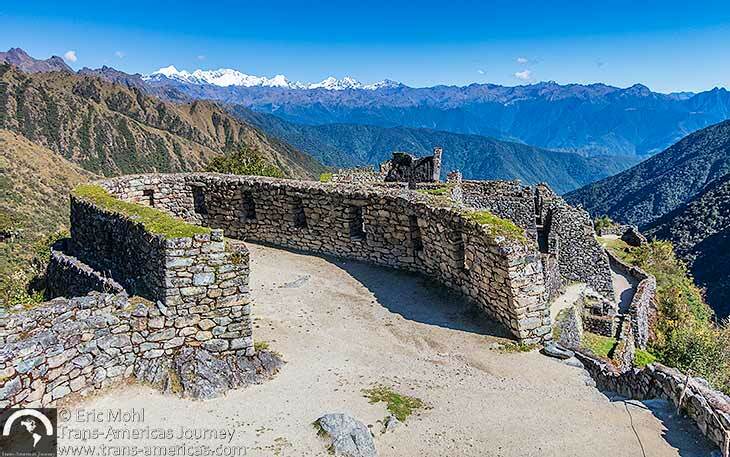 Here’s our map of the classic Inca Trail trek to Machu Picchu route, including passes and archaeological sites, followed by details about each of the four days we spent on the trail. 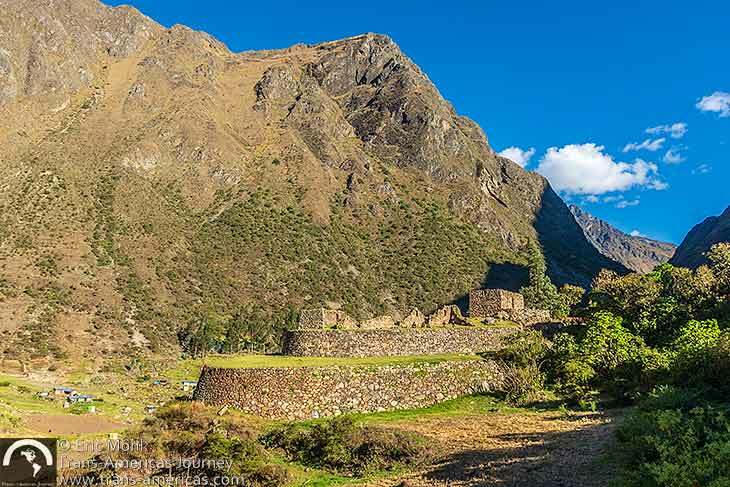 Heading for the bridge over the Urubamba River on day 1 of our Inca Trail trek to Machu Picchu. Day 1 is the easiest day. 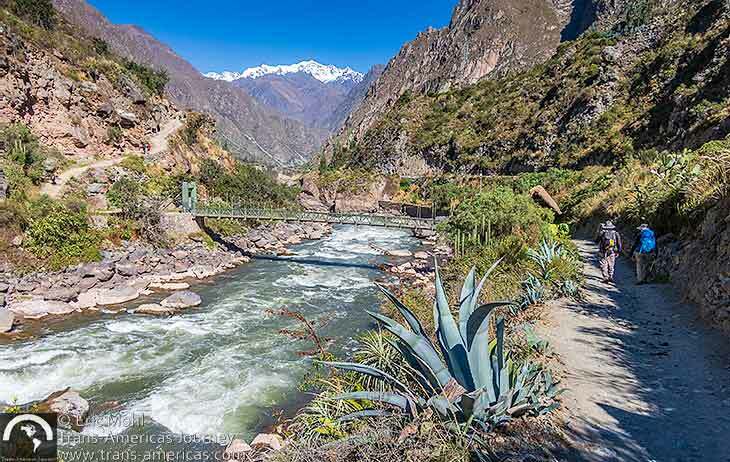 At km 82, the official start of the trail, you pass through two checkpoints then cross the Urubamba River. On this day, the trail itself was mostly flat with some short uphill bursts and some undulating terrain, but nothing even vaguely extreme. What was extreme were our views of the snowy, imposing peak of 19,334 foot (5,893 meter) Veronica set against clear blue skies. 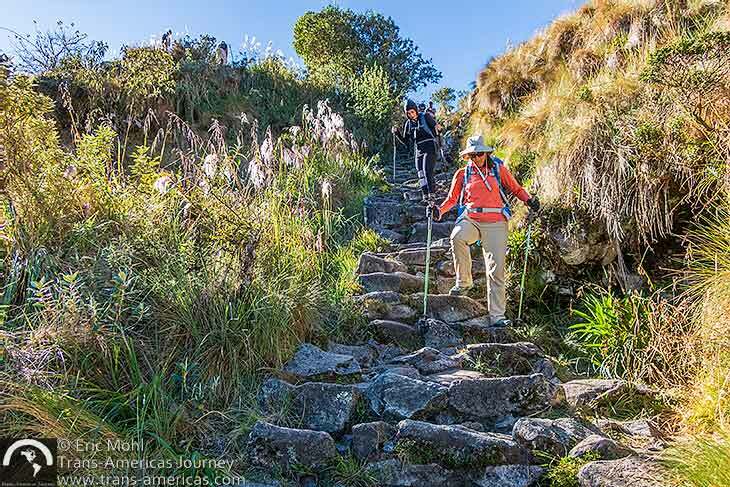 You will certainly not have the trail to yourself, but we never felt too crowded during this most popular trek in Peru and we enjoyed the company of snow-capped Veronica peak for most of day 1. 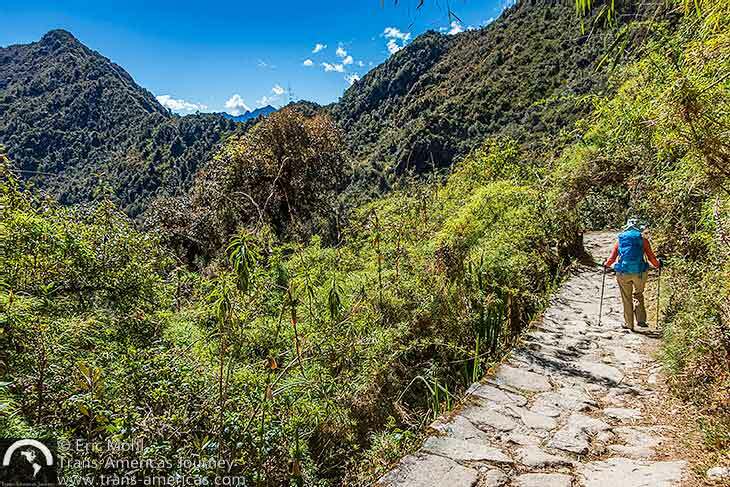 As we’ve said, this is the busiest trail in Peru and we were with about 150 other trekkers plus their guides and porters which outnumber travelers on the trail. 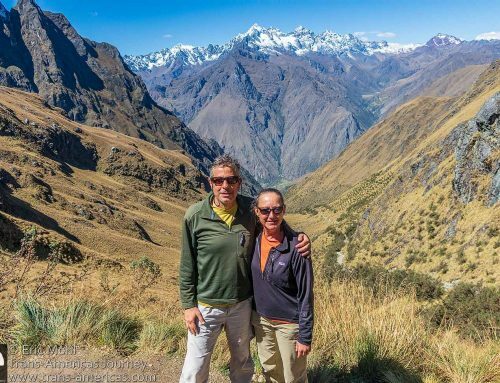 For example, the two of us had seven porters, a cook, and our guide Herbert Saldivar who was born in Pisac where his father still farms quinoa. Herbert started out as a porter, then learned English and did his five-year guide training course to become a guide. The Patallaqta archaeological site which we visited on day 1. Even with all those people on the trail it never felt unbearably crowded. 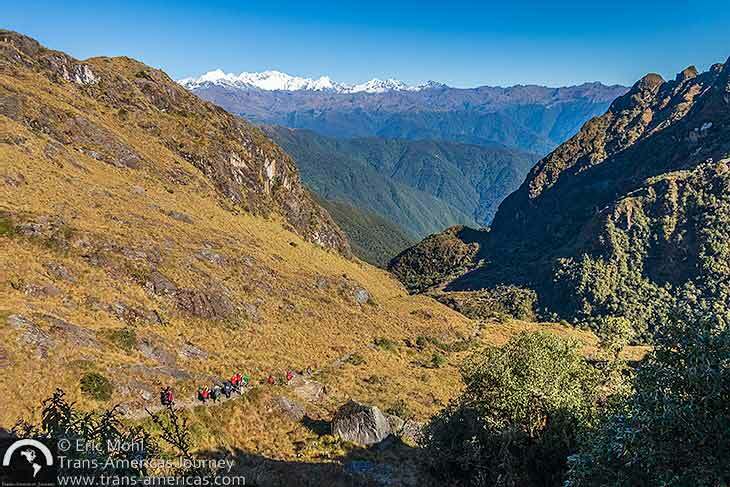 The travelers quickly spread out walking at their own individual paces and the porters and staff moved ahead in a hurry to get to lunch stops and camping areas before their trekkers arrived. After about 2.5 easy hours on the trail, we stopped for lunch and a shaded rest. 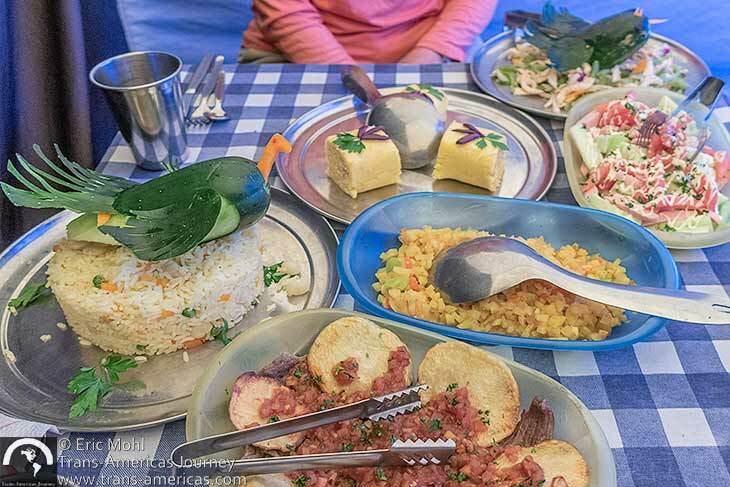 Our creative and talented camp cook, Mauro, had whipped up a meal of avocado salad, fresh vegetables (carrots, beans, potatoes, choclo corn), warm lupine bean salad, pan-fried trout, a passionfruit beverage, and hot tea. The Willkarakay archaeological site which we visited on Day 1. About an hour and 15 minutes later we reached our first campsite of the trek which was spread out over a few separate areas so that each trekking group wasn’t on top of each other. Our roomy 4-person North Face tent was set up and tea was on the way when we arrived. A passably clean flush toilet was located in a shed nearby. Warm water was provided for a quick wash up of hands and faces along with a hand towel. Our meals were plentiful and delicious and included plenty of vegetables. Because our group was so small (just us), we ate in part of the cook tent, so it was very warm. For tea we got fresh popcorn, fried wontons with cheese, tea, and real coffee made in an Italian stove top espresso maker. Dinner, just a few hours later, was chicken legs, meatballs, soup, pasta salad topped with a vizcacha carved out of a vegetable, steamed broccoli (not soggy), and a Spanish tortilla with potatoes. Throughout the trek, tea time snacks and meals were equally delicious, full of fresh well-prepared vegetables, and portions were huge. We ate better on this trek than on any other guided trek we’ve ever done. The Patawasi archaeological site was just a short walk above our first campsite. The Inca Trail leading up, up, up to Dead Woman Pass. Day 2 is the most physically challenging day with a route that essentially goes straight up 4,000 vertical feet (1,200 meters), then straight down 2,000 vertical feet (600 meters) with a combination of steep trail, high altitude, and the coldest temperatures. Our 6 am wake up came with hot coca tea at the tent. After a huge breakfast including a thin omelet with vegetables and salty local cheese, fruit salad with pears, kiwi, and strawberries, real coffee, hot chocolate, bread, and jam we all agreed that the day’s trail would be best tackled in one straight shot with no long break to sap our momentum, so we pushed through all the way to our campsite before having lunch. Karen tackling the final push up Dead Woman Pass. The high point of the day, literally and figuratively, was 13,829 feet (4,215 meters) Dead Woman Pass (so named by Hiram Bingham because the rocks at the pass look a bit like a woman’s profile, but the local name for this pass is Abra Warmi Wañusqa). The trail up took about four hours and was steep, rocky, and included plenty of stone stairs. Then it was another 1.5 hours of steep downhill trail over more stairs before reaching camp. 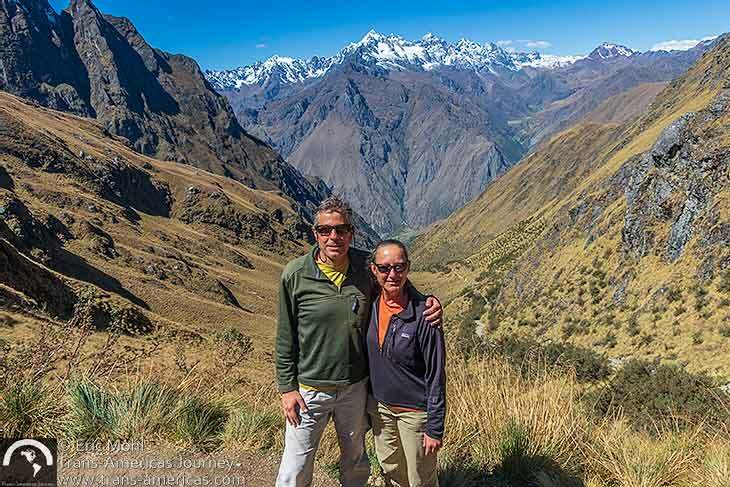 On this day we were high enough to enter treeless pampa where Herbert told us spectacled bears and pumas have been seen. 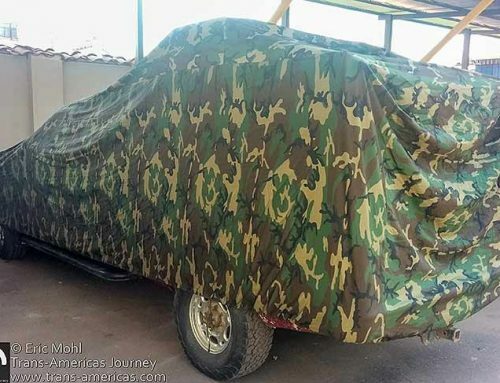 All we saw was a deer. Us at the top of Dead Woman Pass. It’s worth noting that the bathroom at the rest stop shortly before the last push to the pass offers the best toilet on the whole route. It’s new and clean and is a proper seated flush toilet unlike most other toilets on this trail which are dirty, wet, and the squat variety which is a cruel joke for a bunch of folks with burning thigh muscles and aching knees. Karen barely got back up a few times. 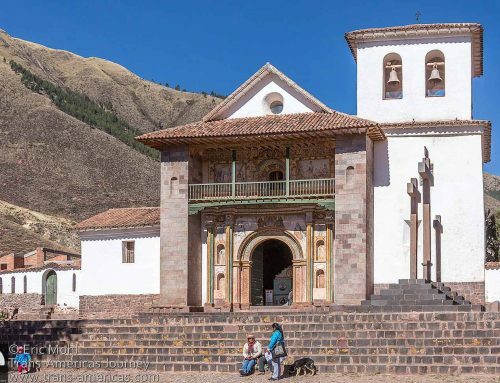 This rest stop is also your last chance to buy stuff from enterprising locals, including a bottle of Queirolo pisco acholado for 70 soles (US$21) which is not that much more than it sells for in stores in Cuzco. What goes up must come down…the steep descent from Dead Woman Pass. The campsite on day 2 is the highest which means it’s also the coldest, though it was not as cold as we expected (though still too cold to use the cold water shower). Our lunch at camp after completing the day’s route included lomo saltado, pasta, quinoa, fried chicken strips, and cucumber and tomato slices, then we had the whole afternoon to relax. Tent with a view at the second campsite of the trek. This campsite felt more crowded than the previous camp with tent groups set up on terraces that spilled down a slope. One bonus: we had an awesome mountain view from our tent. The Runkuraqay archaeological site which we visited early on day 3 before heading up to the second pass of the trek. Day 3 is the longest day both in terms of distance and in terms of walking time. It could also be the most physically challenging day if, like Karen, you hate going downhill. 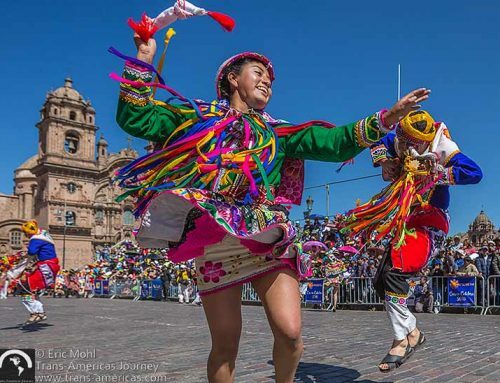 Your guide will probably tell you that this is the most beautiful and culturally rich day, and that’s true too. 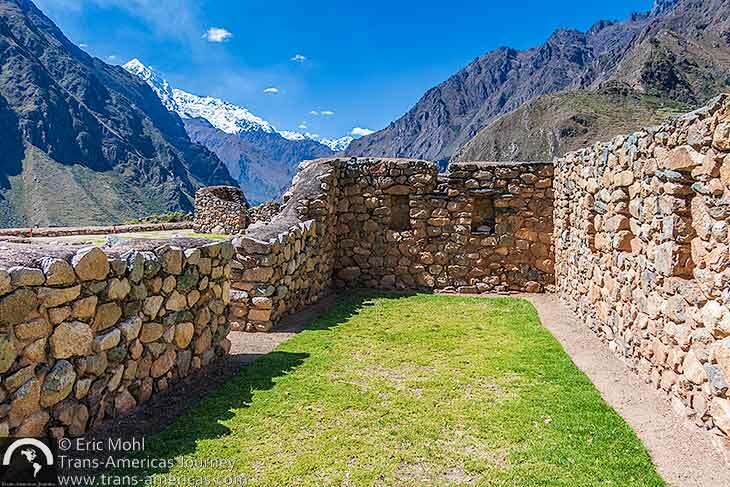 That’s because on this day the trail is 80% original Incan Trail and you visit six archaeological sites along the way. The view from the top of Runkuraqay Pass with the Vilcabamba mountain range in the distance. Karen navigating the trail down from the Runkuraqay Pass on day 3. There was frost on the tent and on the ground when we got up at 6 am but we were warm by the time we hit the trail and started the climb over the second pass of the trek, but first we paused to visit the small Runkuraqay archaeological site. The Sayakmarka archaeological site which we visited on day 3. After crossing over the Runkuraqay Pass, which was easy compared to Dead Woman Pass from the previous day, we reached the Sayakmarka archaeological site which we accessed via a short trail above the main trail to see a small complex of building remains on a bluff with strategic views of the area. Mountain views from the Sayakmarka archaeological site. 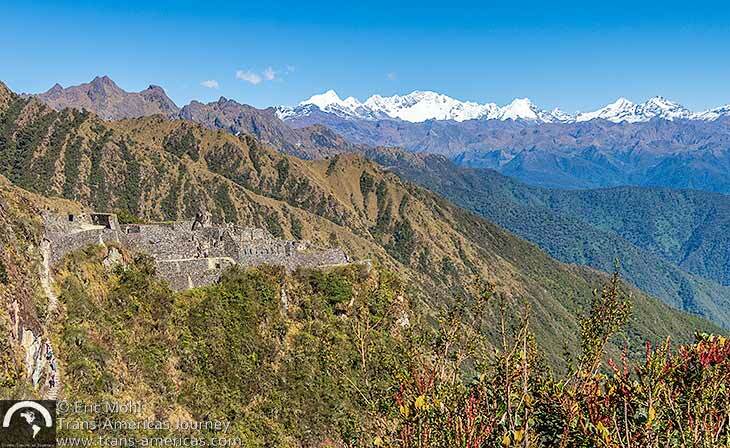 Just below the Sayakmarka site is the Qonchamarka archaeological site which the trail skirts around. Further down the trail, we reached our early lunch spot, but the best was yet to come. The Qonchamarka archaeological site which we walked past on day 3. Our scenic lunch spot on day 3. Still gently climbing toward the second pass of the day, we headed out on the most gorgeous stretch of trail on the whole trek. 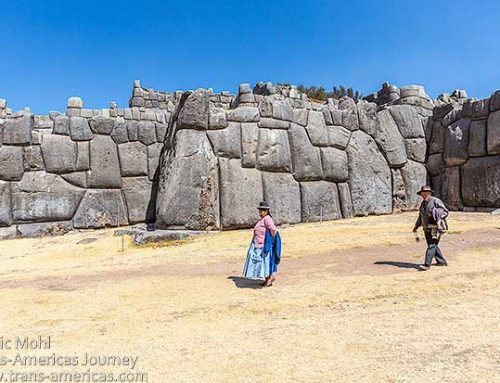 Here the Incas built a wide, rolling trail with gorgeously curved retaining walls and even a tunnel carved through a natural crack in a massive rock. 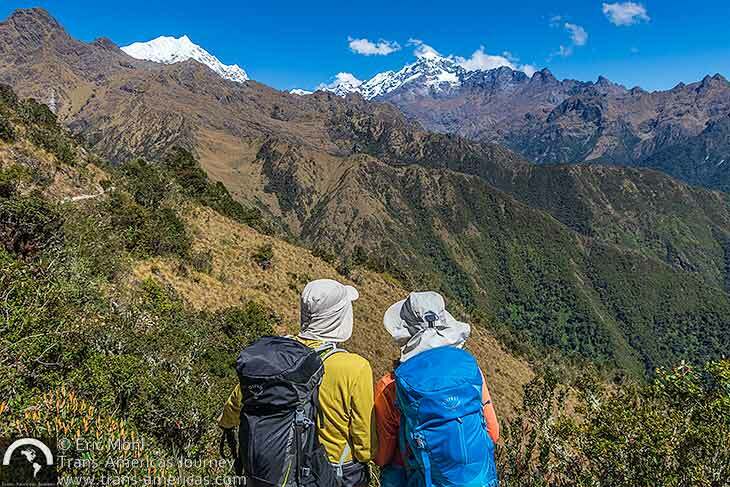 We took a break to admire clear views of Salkantay mountain. We could have continued all day on this trail as we passed through a cloud forest with bamboo, flowering plants, and dappled sunlight. As we turned a gentle bend in the trail we also got a crystal clear view of 20,574 foot (6,270 meter) Salkantay mountain which seemed close enough to touch. 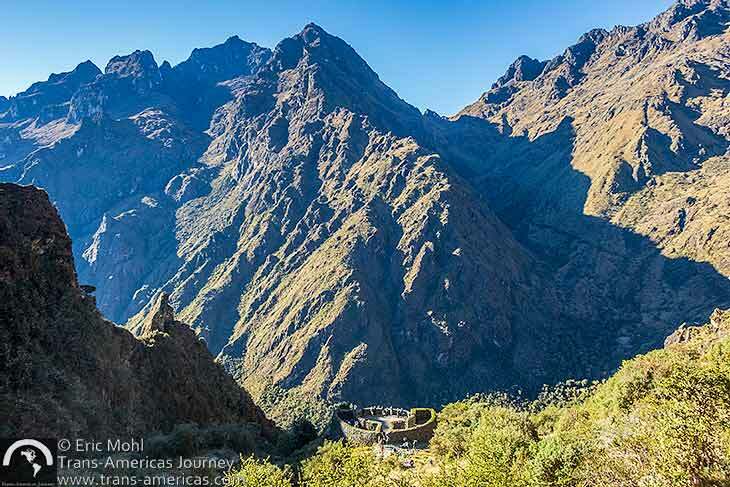 A particularly beautiful stretch of Inca Trail on day 3 of our trek. 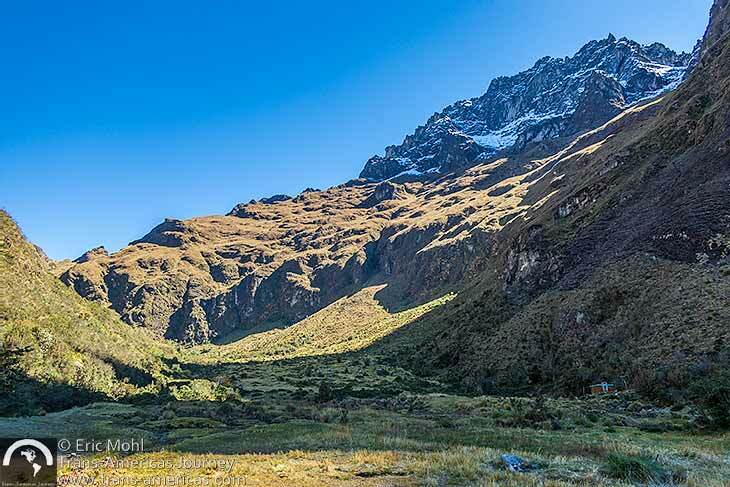 This wonderful trail gently brought us to the third and final pass of the trek at 12,045 feet (3,671 meters) and we got our first glimpse of Machu Picchu peak which looms over the Machu Picchu site. After a quick break to admire the view, we descended a few minutes to the trailside Phuyupatamarka archaeological site with its unusual round buildings. From the Phuyupatamarka archaeological site we could see Machu Picchu Peak (the darker, pointy peak just behind the people) which looms over the Machu Picchu site which is hidden behind. Then it was time for the challenge of the day: around 5,000 steps down, many of them very steep and most of them made of rock and stone in typical Incan style. The porters took the 3,000 foot (900 meter) descent at a gallop and because they’re so quiet it was important to keep looking behind us so we could get out of their way as they passed in a flash. Karen navigating a stretch of roughly 5,000 stairs during an epic descent on day 3. Finally, the trail started to flatten out and our knees got a break as we reached the Intipata archaeological site with its steeply terraced hillside (even by Incan standards). At one point we had to shoo llamas off the trail. 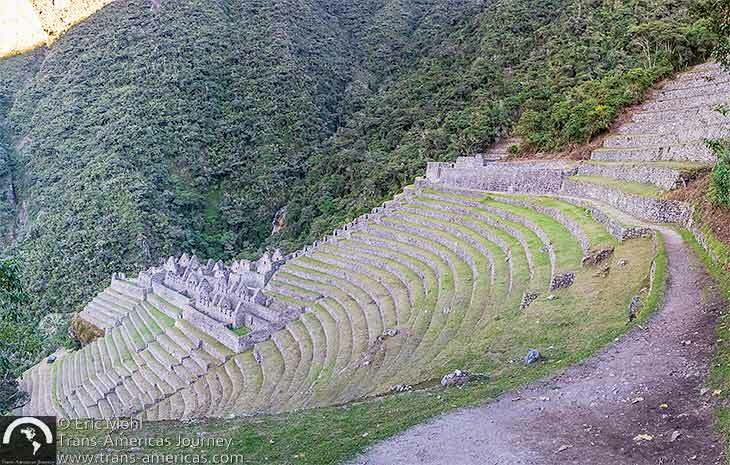 The steep terraces of the Intipata archaeological site which we reached near the end of day 3. The upside of descending so far is that we got warmer temperatures and thicker air. Despite those more comfortable conditions, the third camp was the least pleasant with tents crowded together and dirtier facilities. We could also see a glow in the sky from the lights of Aguas Calientes town around a bend in the valley below and we could hear the train whistles going into and out of the busy station there. Herbert told us there are now 33 trains in each direction every day running through the Aguas Calientes train station until 9:30 pm. The Wiñawayna archaeological site near the third and final campsite of the trek. 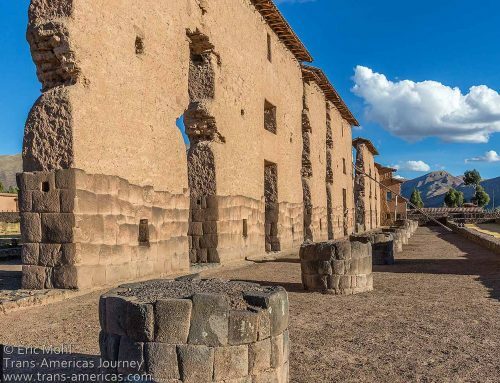 A very short walk from camp leads to the Wiñawayna archaeological site with its terraces peppered with the remains of buildings. Structures at the Wiñawayna archaeological site. Views from the Wiñawayna archaeological site. Day 4 is the shortest and lowest day of the trek, but it’s also the earliest. We were up at 3:30 am so that our porters could break down camp, pack it up, and hustle down the mountain to catch a train out. 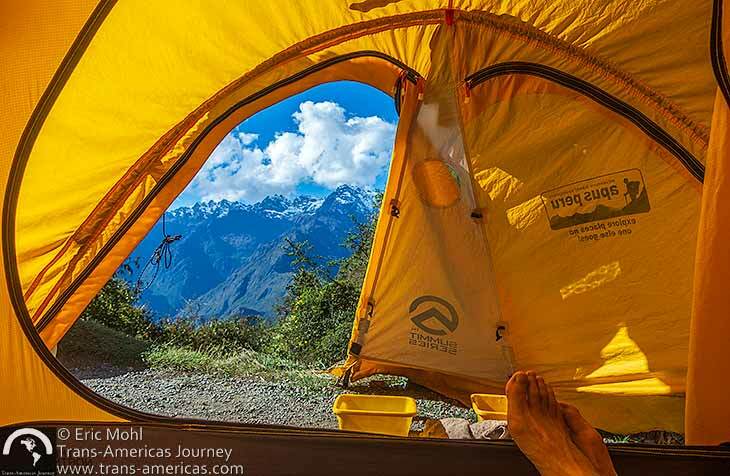 That would have been fine (when you’re curled up in your sleeping bag by 8 pm every night, getting up before dawn is no big deal), except for the fact that the guard post on the trail between camp and the Machu Picchu site doesn’t open until 5:30 am. This means that trekkers wait around in the dark for at least an hour before they can hit the trail. Layer up. It’s cold before the sun comes up. Us with our guide, Herbert, at the Sun Gate entrance to the Machu Picchu archaeological site. On the trail, we undulated for about an hour and a half before reaching the Sun Gate high above the Machu Picchu site. It was a dramatic way to enter the Machu Picchu site and a satisfying end to our time on the trail. 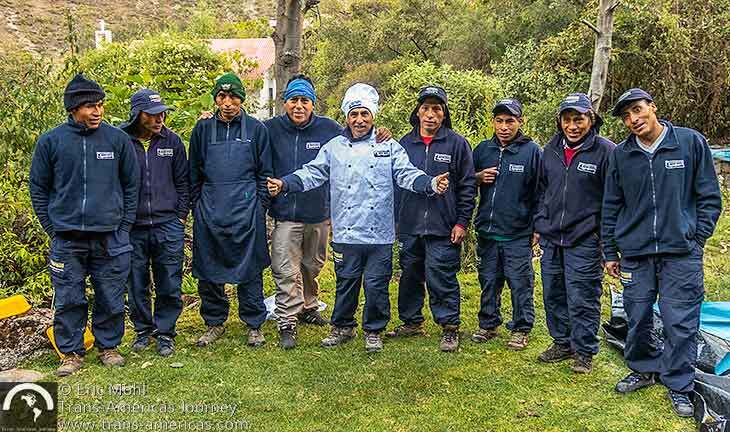 Our awesome porters, our terrific guide Herbert (fourth from left), and our talented cook Mauro. Each trekker is limited to 15 pounds (7 kilos) of gear, including your sleeping bag, to be carried by porters who are capped at 45 pounds (20 kilos) each. So it’s important to take only the most vital things. 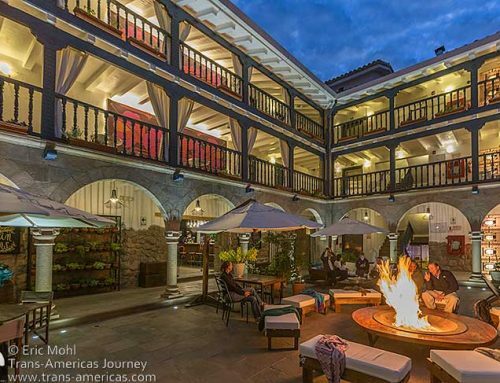 The Apus Peru website includes a very comprehensive packing list. Karen and her Osprey pack which made its debut during the Inca Trail trek to Machu Picchu. We can vouch for the importance of the following items that we were really glad we had: trekking poles and rubber tips for the poles (mandatory), plenty of Point6 merino wool socks to keep feet blister-free while walking and warm and cozy in camp, our Therm-a-Rest pads (which we put on top of the fabric pads provided by Apus for fewer lumps and more warmth), body wipes (unless you don’t mind trail stink or you’re brave enough for a dip in the freezing cold streams and occasional cold shower at campsites), our Crocs to slip into at camp to give our feet a break, our fleece mini pillow cases which we stuffed with our down coats to create comfy pillows, good sunscreen of at least SPF 30, and layers of clothing – the temperature varied throughout the day and sometimes we were hiking in short sleeves and sometimes in many layers. We carried all of our daily trail needs (layers, sunscreen, water, etc.) in our brand new Osprey Sirrus 36 women’s pack and Osprey Stratos 36 men’s pack which were both more comfortable than any other backpack we’ve ever owned. 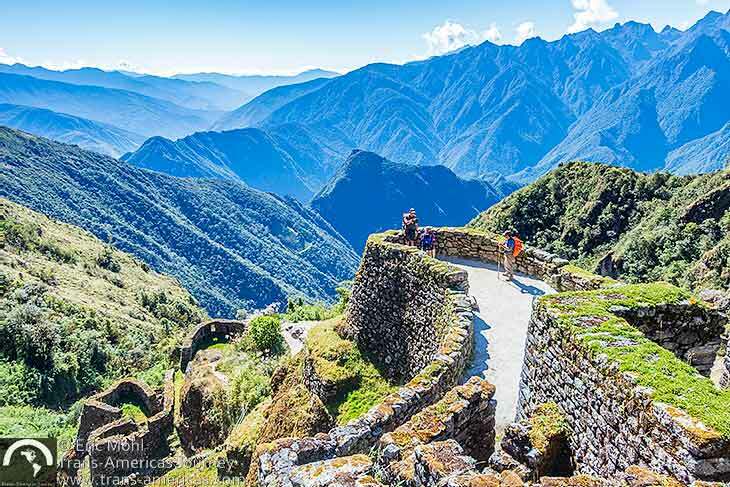 Note that drones are NOT allowed on the Inca Trail or at Machu Picchu. 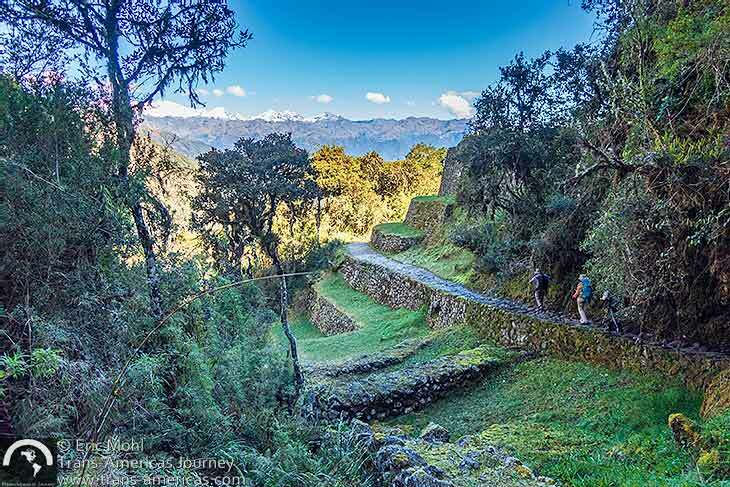 The Inca Trail trek to Machu Picchu takes place inside the Machu Picchu National Sanctuary and drones are forbidden in all national parks and archaeological sites in Peru. We wish we’d brought a deck of cards or lightweight paperbacks. We were often in camp by early afternoon with plenty of time to read or play gin rummy. Leaving the town of Aguas Calientes we took the new Inca Rail 360° Machu Picchu train to Ollantaytambo (US$75-US$105 each way). The open-air observation car on the new Inca Rail 360° Machu Picchu train we took from Aguas Calientes to Ollantaytambo after our Inca Trail trek to Machu Picchu. This train has enormous windows, electrical outlets at every seat, and a standing open-air observation area which Eric loved as a place to take photos. 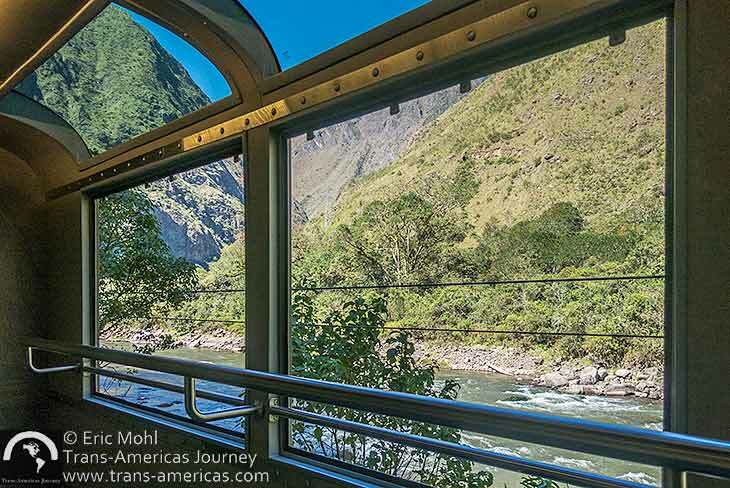 We believe the only other train on this line that has an open-air car is the luxury Hiram Bingham train. The Inca Rail 360° Machu Picchu train also has something called InTrain, an onboard information service, in English and Spanish, that passengers can access on smartphones to enjoy maps, commentary along the route, music, and more. Don’t get too excited by the advertised “gourmet and organic delights” served on board. When we were on the train this consisted of a soggy tortilla filled with supermarket lunch meat and cheese. 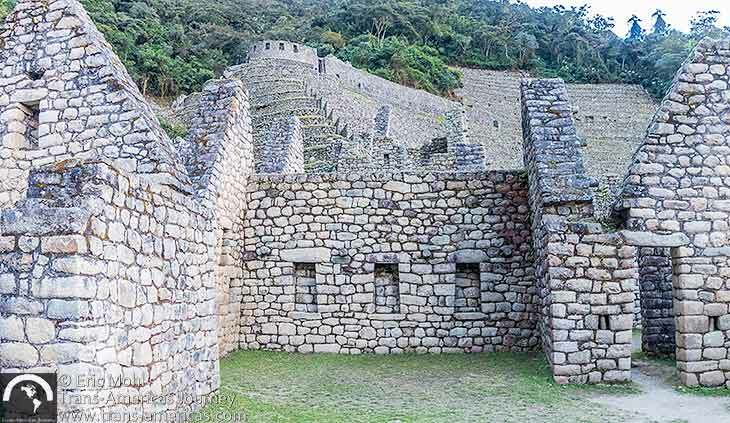 There’s even more information about Machu Picchu in our post about exploring the Machu Picchu site and in our complete round up of all of the way to travel to Machu Picchu (there are more options than you think). Great info. Excellent pictures. Thanks for your comprehensively detailed report. Very useful! 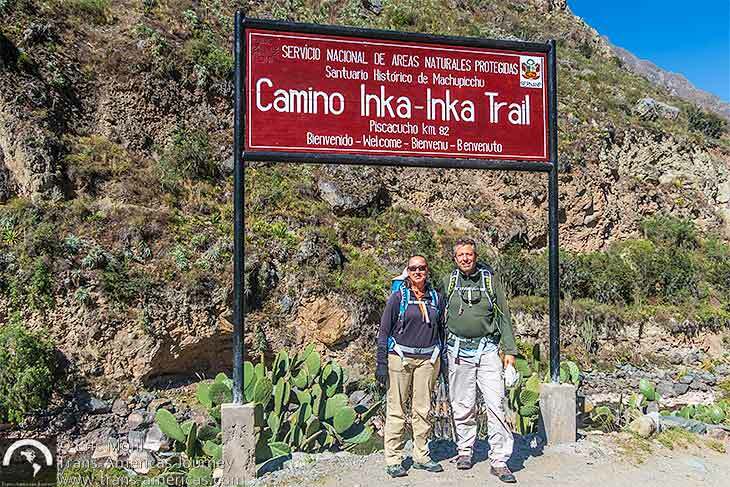 This is one of the most detailed and exceptional guides for hiking the Inca trail, well done Karen! Just Google it. The date changes each year.